Buffet-style cafeterias allow you to select an assortment of foods that suit your diet (and budget). 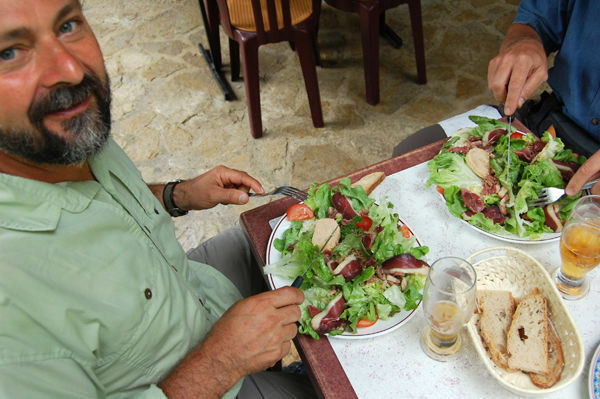 Vegetarians find life a little frustrating in Europe. Very often, Europeans think “vegetarian” means “no red meat” or “not much meat.” If you are a strict vegetarian, you’ll have to make things very clear. Write out the appropriate phrase (see sidebar), keep it handy, and show it to each waiter before ordering your meal. Vegetarians have no problem with continental breakfasts, which are normally meatless anyway. Meat-free picnic lunches are delicious, since bread, cheese, and yogurt are wonderful throughout Europe. Have some healthy snacks (such as nuts or fresh produce) on hand, in case you can’t find a suitable meal. It’s in restaurants that your patience may be minced. Big-city tourist office brochures list restaurants by category. In any language, look under “V.” For a good meal, seek out a vegetarian restaurant (most big cities have them; check a website such as HappyCow for ideas), or browse the menus at some fine-dining restaurants, many of which pride themselves on offering at least one good vegetarian option. In my guidebooks, whenever possible, I make it a point to list a good vegetarian restaurant in each city. Cafeterias (such as the bright, cheery, fresh, affordable ones you’ll find on the top floor of major department stores) are a good option for vegetarians, since you can see exactly what you’re getting and select an assortment of foods that suit your diet. Each country has its own quirks: Italy seems to sprinkle a little meat in just about everything. German cooking normally keeps the meat separate from the vegetables. Hearty German salads, with beets, cheese, and eggs, are a vegetarian’s delight. 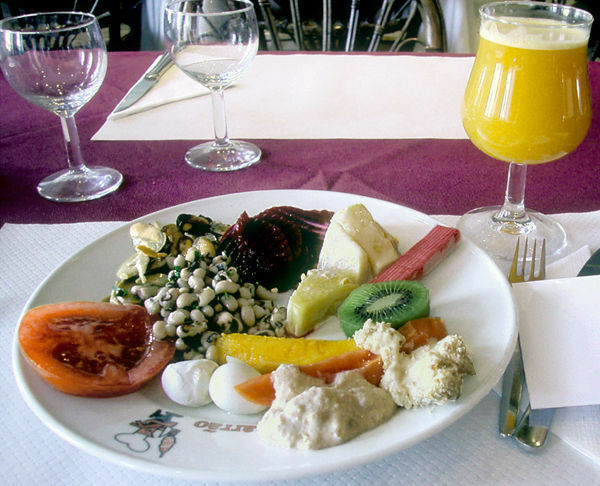 Vegetarians enjoy antipasti buffets, salad bars, and ethnic restaurants throughout Europe. German: Wir sind (Ich bin) Vegetarier. Wir essen (Ich esse) kein Fleisch, Fisch, oder Geflügel. Eier und Käse OK.
French: Nous sommes (Je suis) végétarien. Nous ne mangeons (Je ne mange) pas de viande, poisson, ou poulet. Oeufs et fromage OK.
Italian: Siamo vegetariani (Sono vegetariano/a). Non mangiamo (mangio) nè carne, nè pesce, nè polli. Uova e formaggio OK.
Spanish: Somos vegetarianos (Soy vegetariano/a). No comemos (No como) ni carne, ni pescado, ni pollo. Los huevos y el queso OK.
For your fill of restaurant-ready language help, including more detailed phrases for vegetarians, grab a Rick Steves phrase book.